I think I will not do what I did as in this illustration if I do not intend the share this recipe.. 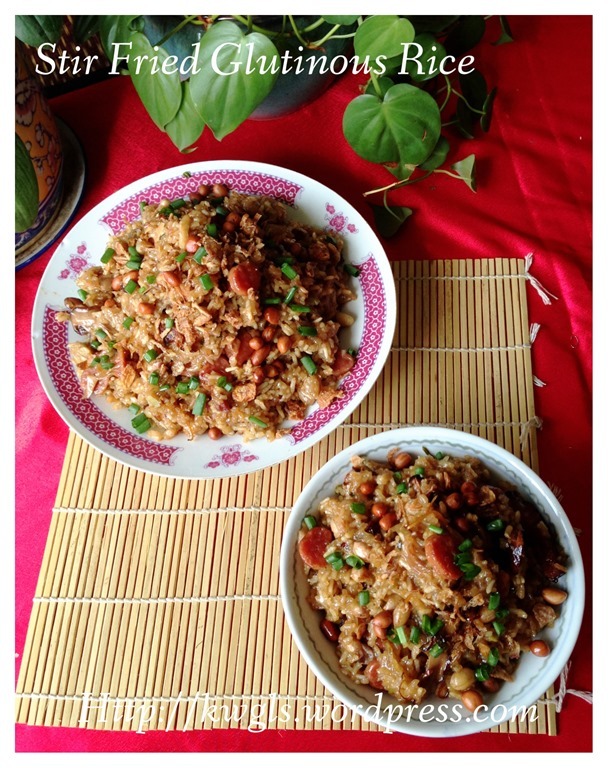 I will dump everything in the rice cooker and have a bowl of nicely cooked savoury glutinous rice with very negligible difference in texture and taste of this dish. However, as a respect to traditional recipes, I have decided to share with all how this dish was prepared traditionally. I am unsure when was rice cooker being introduced to the world, but since it is a traditional dish, it was definitely cooked over the stove by our fore fathers. 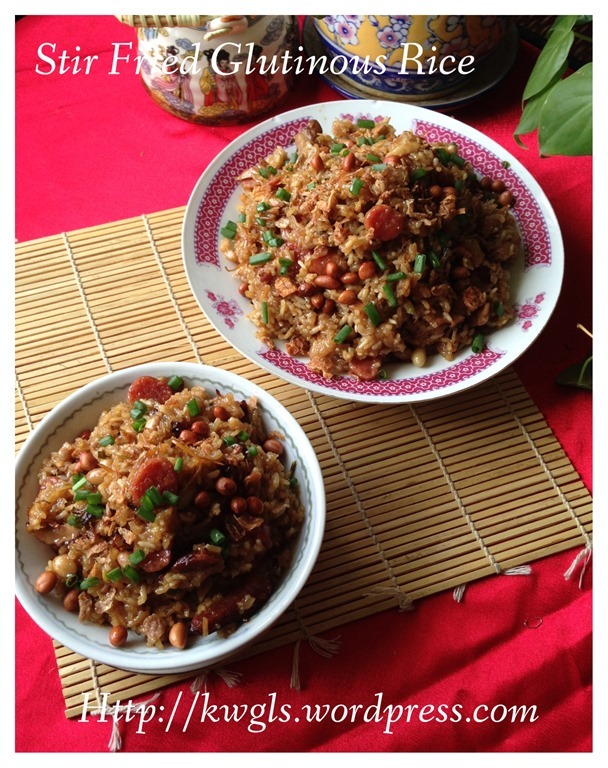 It had a unique name of “Stir Fried Glutinous Rice Dish” (生炒糯米饭）basically means stir fry the raw glutinous rice grains in the wok until it was cooked. 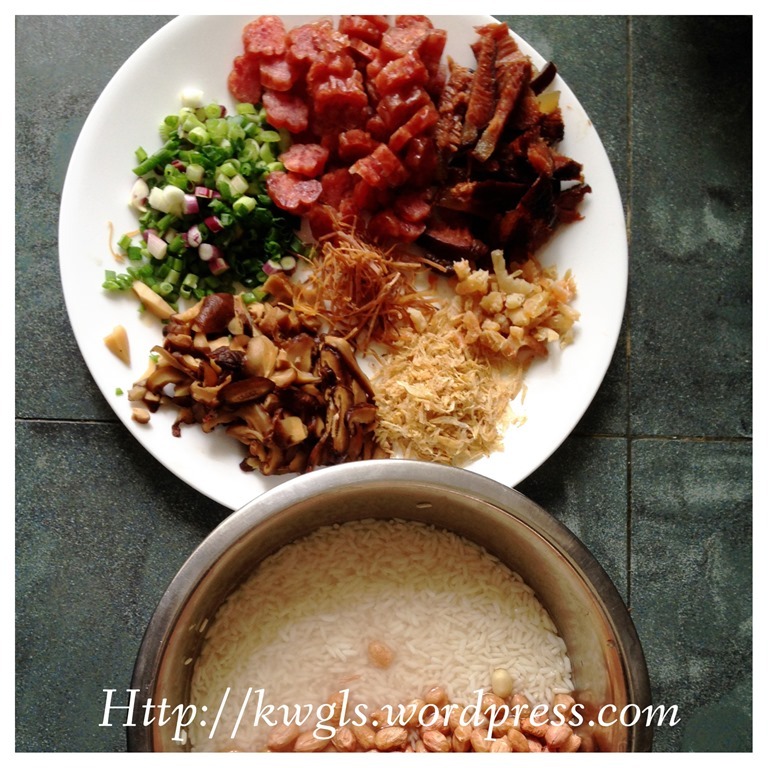 It is definitely not easy to stir fry glutinous rice over a wok and stove as glutinous rice is sticky and it had a tendency to get burnt if not properly monitored. While some of the rice are burnt, some rice may be uncooked. As such, full attention is needed to prepare this dish. Wait, I am not discouraging you to trying out this recipe.. With the availability of many modern kitchen equipment, it made life much easier. We have non stick pan and it saves us some effort in stir frying the dish. If you want to have an easier life, you can use a rice cooker sticky rice function to cook a rather perfect glutinous rice dish and I have been using rice cooker all these years.. Well, other families or restaurant may resort to pre-steamed the glutinous rice until cooked and only start the stir frying at the last stage.. Whatever it is, find a method that you are most comfortable with and try out the recipe.. 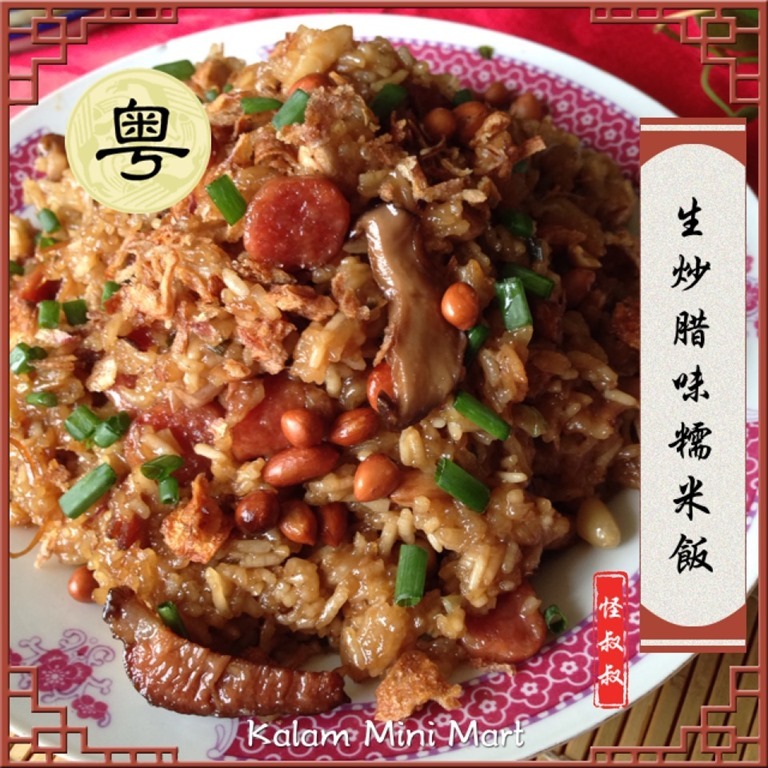 This is a Cantonese famous dish that was served in the dim sum restaurant. It was also a common household dish that families prepared during winter to sooth and warm the body. 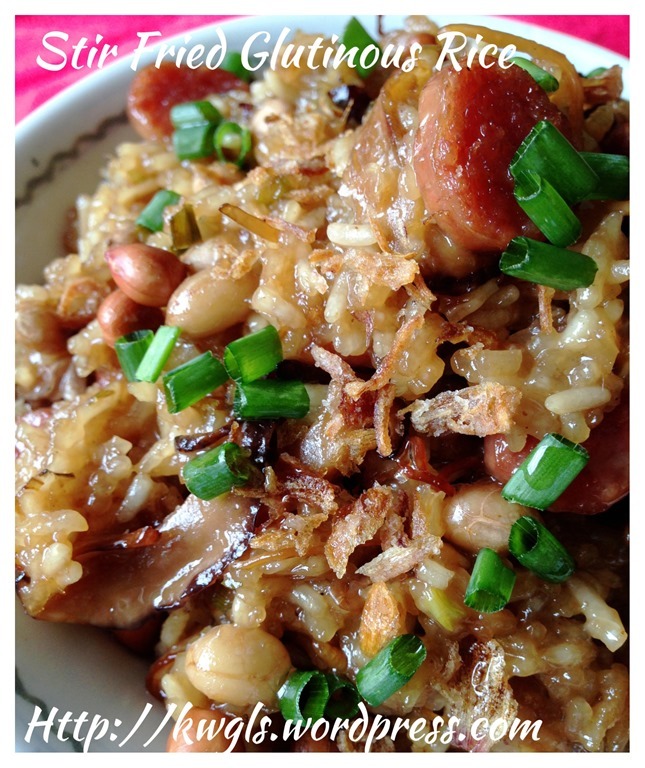 At times, Chinese sausages or other type of Chinese preserved meats (腊味）were added to the dish. 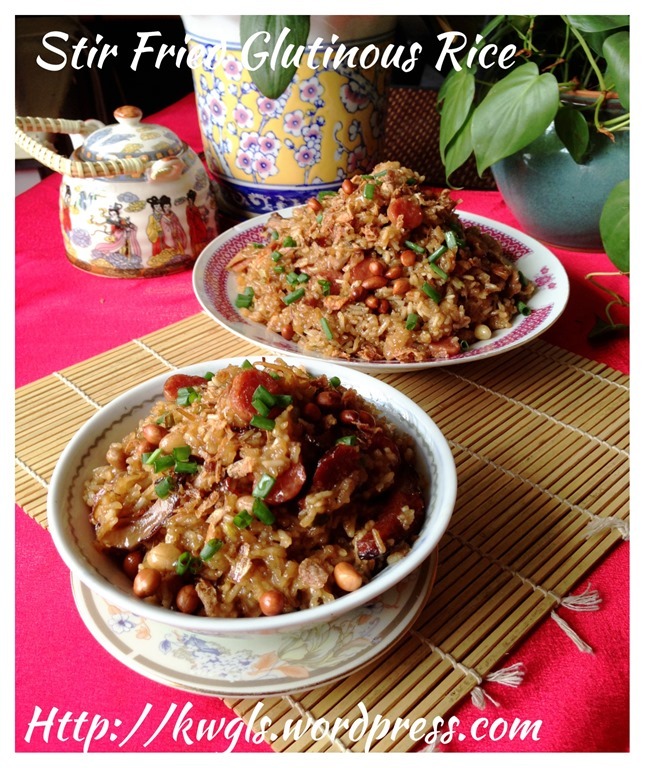 Pre-soak the glutinous rice for at least 4 hours. 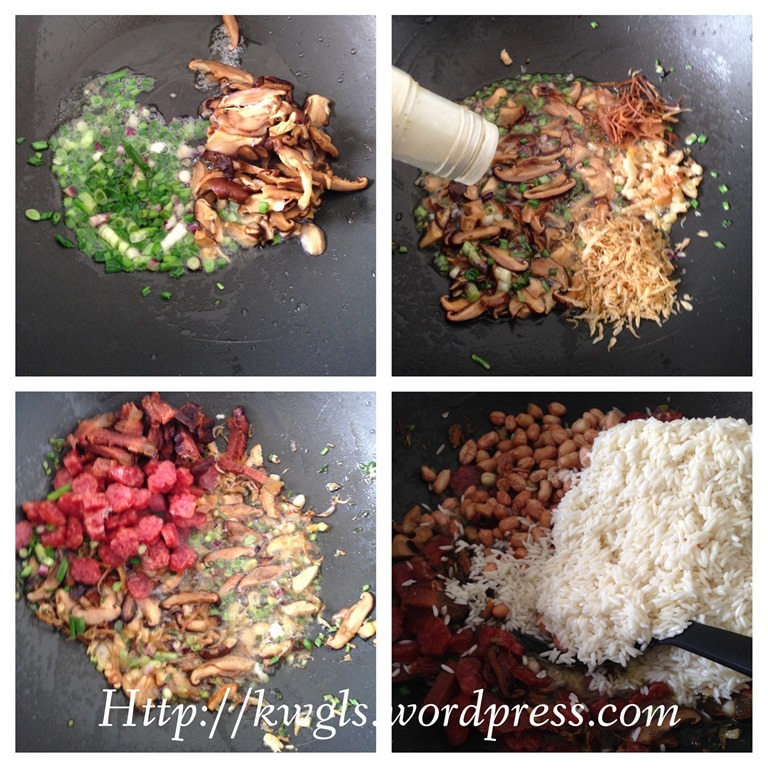 Heat up a non stick frying pan or wok, put the oil, sauté the spring onions and mushrooms until fragrant. Add the dried shrimps, squid and scallops, stir fry until aroma starts to emit (about 1-2 minutes). 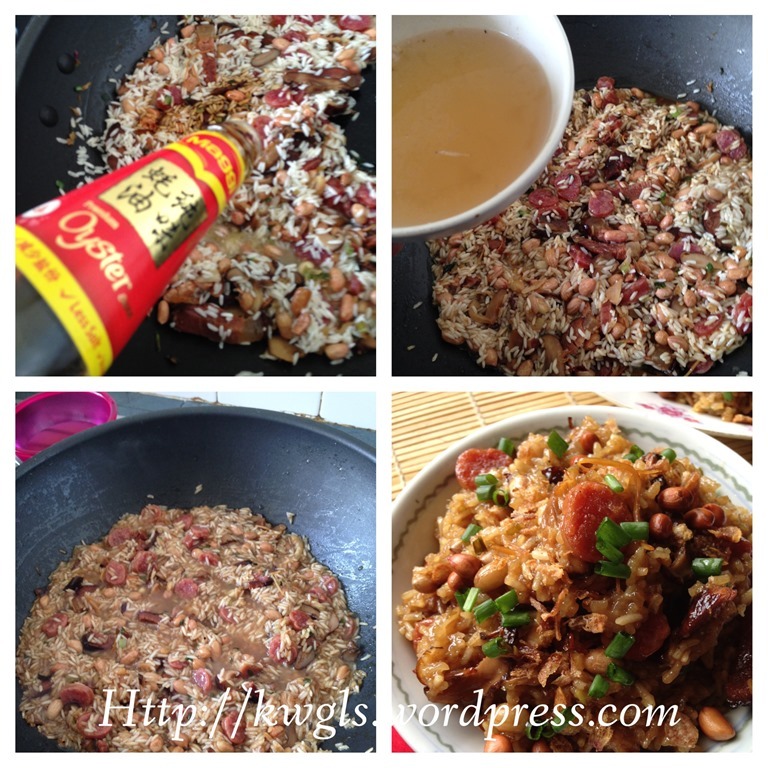 Add dashes of white pepper and followed by the Chinese sausage cubes and Chinese preserved meat, stir fry until well mixed. 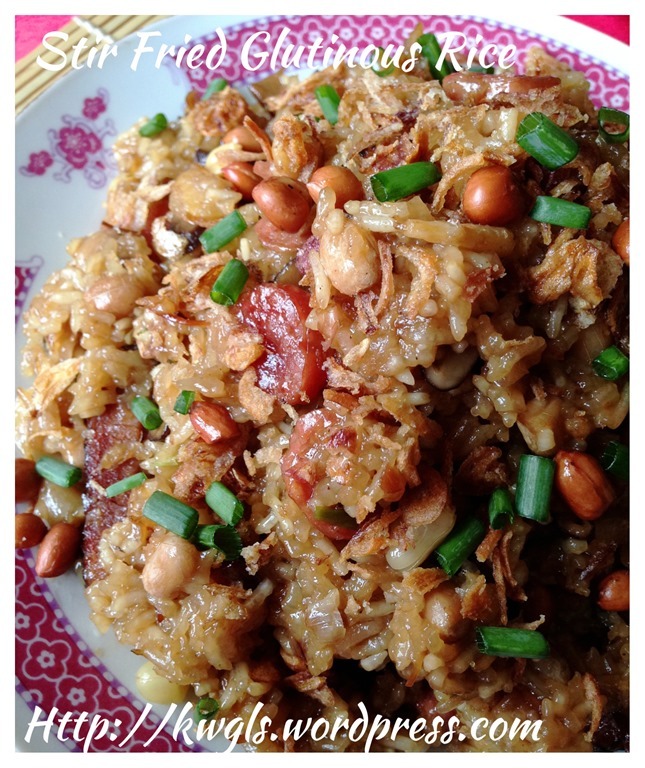 Add in the soaked glutinous rice and peanuts. It took me about 25-30 minutes for this stir frying exercise. I have add about 20 % of the water to the rice, stir fry and let it cook for 5 minutes. Add water, stir fry and cook for 5 minutes and repeat the same until the water were all used up. However, towards the end at about 20 minutes juncture, I stir fried the sticky rice for almost every two to three minutes to ensure that the rice were not burnt. You may or may not need to use up all the water as suggested. 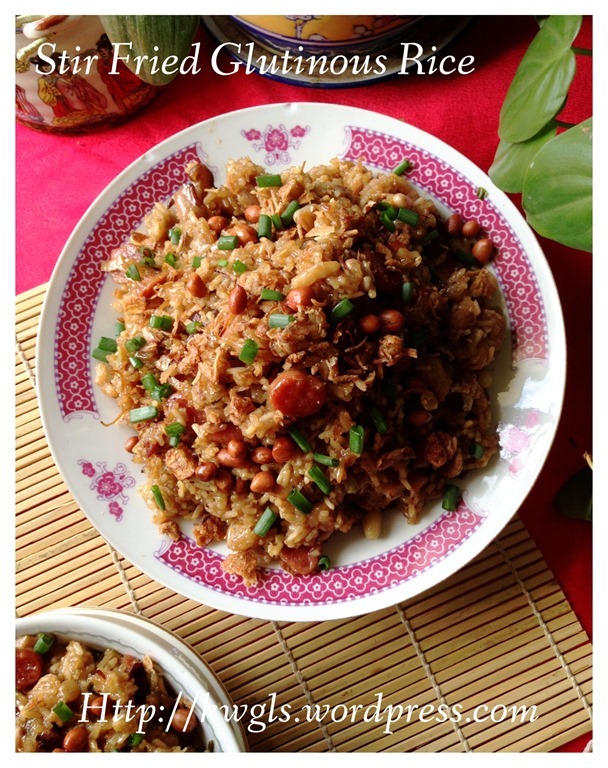 The amount of water very much depends on the water absorbing power of your glutinous rice..
You can pre-steamed the soaked glutinous rice until cooked and followed the stir frying process. In that case your stir frying process will be relatively short with the aim of flavouring the rice. Before steaming, you can add in all the seasonings too. 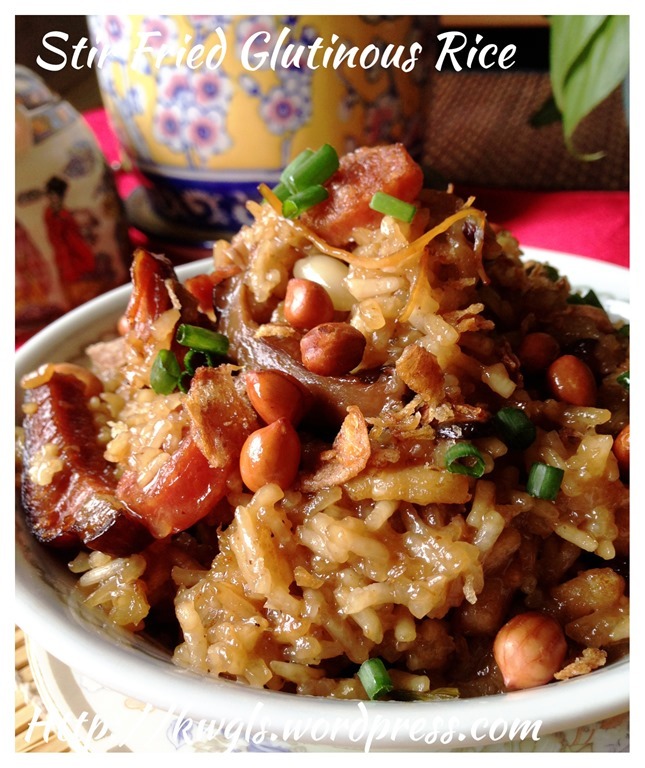 I loved these cooked glutinous rice. It is flavourful and aromatic. 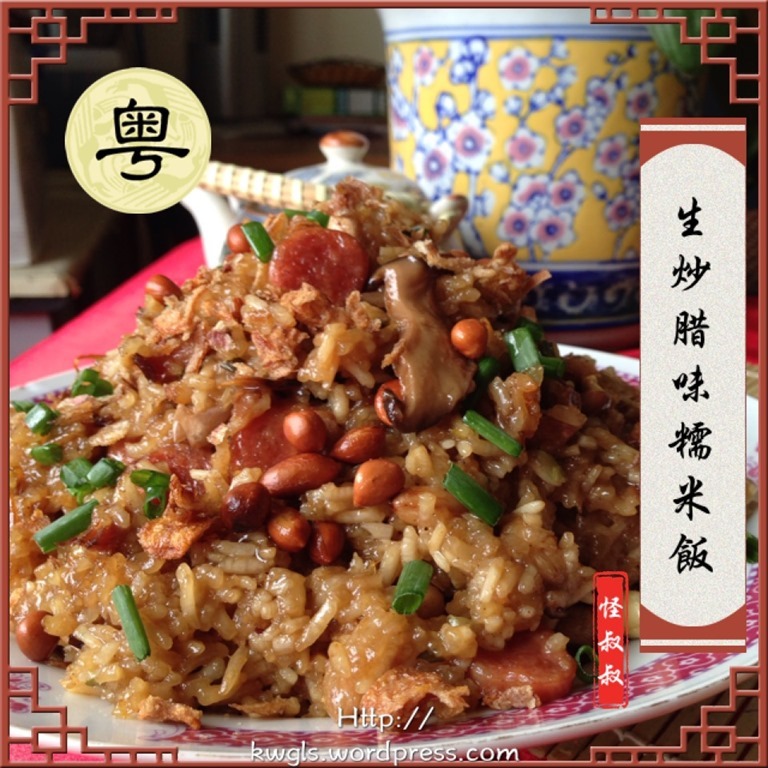 Since for this illustration, I have cooked more than what the family can consume, I have used some of these glutinous rice to prepare the Teochew rice peach cake as in the above picture.. 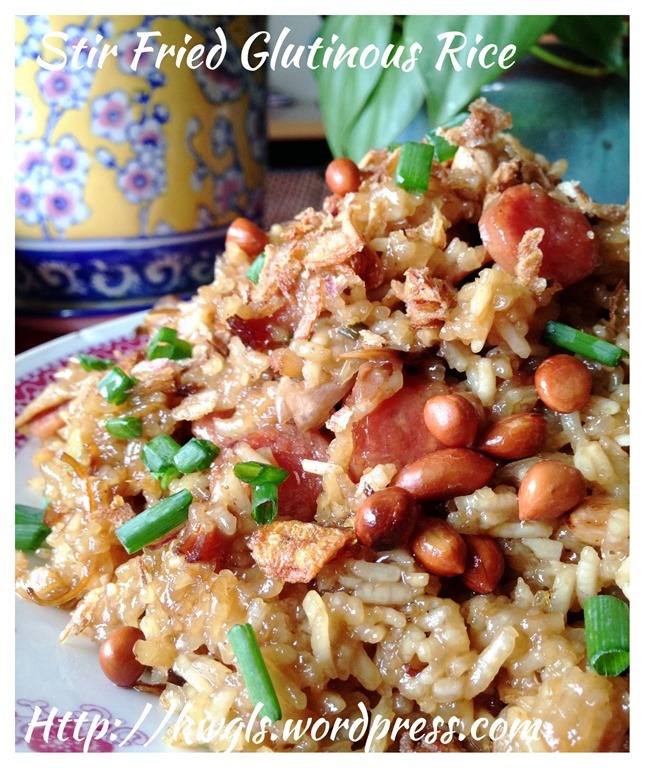 Remember that you can always pre-steamed or use the rice cooker to cook this delicious dish and this will make your life much easier. 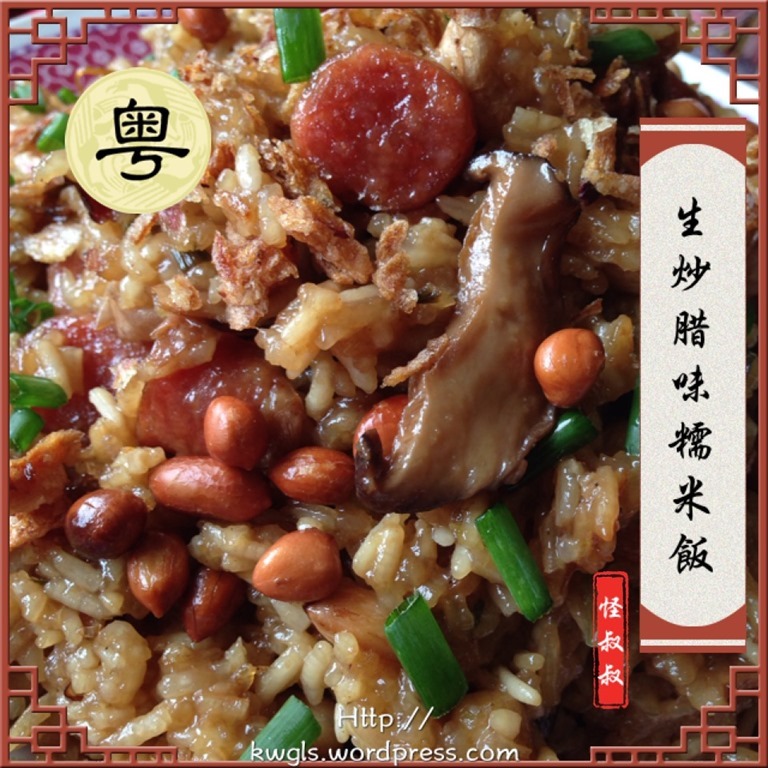 This entry was posted in Chinese and Asian Cakes and Snacks, Food Preparation Series, FOOD, FOOD, FOODS...., Noodles, Rice and Others and tagged 生炒糯米饭， 8， postaday, GUAI SHU SHU, Guaishushu, kenneth goh, Stir Fried Glutinous Rice. Bookmark the permalink.